1. Quiet bike rides from the Heatons 2019. Join us for our cycle rides from the Heatons. The rides are shorter than in previous years, for cyclists and families of all ages who are inexperienced or lack confidence on the bike. Rides are supported by trained leaders. Daytime rides start at 9.45, Moor Top pub car park, to end around 12.30, with a refreshment break during the morning. An almost entirely off-road ride, using some of the Fallowfield Loop. This trip uses the Trans Pennine Trail (TPT). It’s 30 years since the TPT was established and we’ll be celebrating with cakes and drinks in Didsbury! On this ride we’ll show you routes to get to Stockport using quiet roads and off-road paths. August 2nd, Friday evening: HandleBards (The Girls): The Tempest. Finish time: performances end about 8:30pm. August 13th , Tuesday evening: HandleBards (The Boys): Much Ado About Nothing. Book a place at cycling@slheatons.org. Be sure to let us know how many adults and children will be coming and on which trips. Participants should bring a roadworthy bike and under 16’s must be accompanied by an adult. 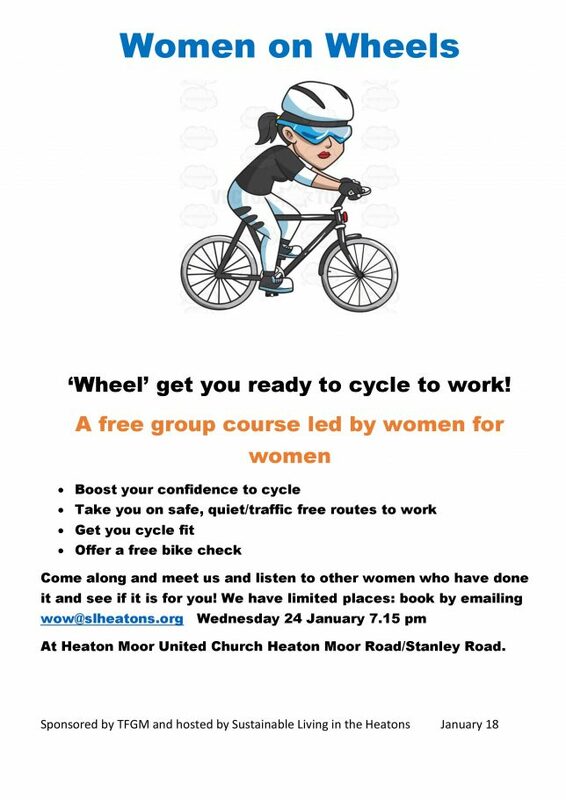 And don’t forget that on the last Friday of each month, there are morning rides into Manchester leaving Heaton Chapel train station at 7:45 am. These Bike Friday rides are organised by FoE rather than SLH. Cycling is a sustainable, cheap, low-energy way to get about with the added benefit of pleasurable exercise, and usually in good company. A recent extensive survey showed that many more people would cycle if they were aware of quiet routes ….. and to help this Stockport (and Manchester in general) has been improving existing cycle routes and adding others, over recent years. We are well served here with many quiet residential streets, plus notably the Trans Pennine Trail passing through Heaton Norris & Heaton Mersey; and with Nelstrop Road in Heaton Chapel or Errwood Road, just over Heaton Moor golf course both linking to the Fallowfield Loop Line. These and many more routes can be seen on the set of 10 TfGM cycling maps either online or in paper form. These show that there are some surprisingly quiet, traffic-free, green corridors through the suburbs of Manchester. Even if you don’t have a bike, most of these routes allow pleasant walking too. 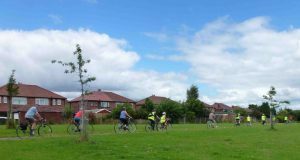 To help make people aware of such routes, SLH has organised several bike rides in each of the last few years, all starting within the Heatons and around 4 to 30 miles long. There’s a list of our previous years’ rides in section 4. Whether you’re fairly new to cycling, coming back after a break or more experienced but wanting to discover more routes, these rides could be for you. We go at the pace of the slowest, so no-one is left behind. Our routes are largely off-road, on well surfaced paths, but sometimes use quiet roads; and to cross busier roads we’re always prepared to dismount and push. Most rides have a specific destination and allow you time there, for example at a Hall, Art gallery or Museum usually with a cafe to enjoy. Or they may be to an event or activity like pond-dipping or bird watching, or even to see a Shakespearean play! Descriptions of past rides & routes will be added to these pages at a later date – these should make it easier to ride independently or inform friends about the routes. 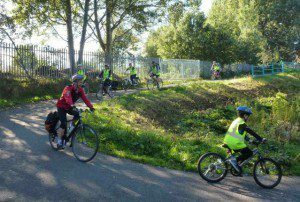 TfGM and associated organisations offer training to cyclists of all abilities from those completely new to riding through to those already much more experienced. They also provide various levels of bike maintenance courses at several centres including locally in Stockport. If anyone is interested in helping with our SLH led rides, there are ride leader training courses available too. All these sessions, apart from for example the most advanced wheel-building courses, are free of charge. Across Manchester there are many other cycling clubs and organisations that might be of interest.